The Honors and Awards Committee of the Connecticut Association of Schools is proud to announce that Old Saybrook Middle School (OSMS) has been awarded the CAS Exemplary School Climate Practices Recognition. This award is based on the committee’s careful review of OSMS’ self-assessment as well as a site visit completed on March 6, 2019. The six-member CAS visiting committee toured the entire school and observed a dedicated staff who is committed to a shared vision of supporting the whole child through the adolescent years and making sure that every student is connected to an adult. Equally impressive was the school’s development and integration of programs that create and maintain positive school climate, including PRIDE, the Consult process and student passports, having a full time SRO/DARE instructor, Advisory, Unified Sports® and restorative practices. The CAS committee was also impressed that students were able to articulate the “how” and “why” of the programs in place; and, the emotional well-being of others and inclusiveness were common themes during conversations with students. The visiting administrators heard glowing testimonials from parents and representatives from Old Saybrook’s YFS and Park & Rec agencies. 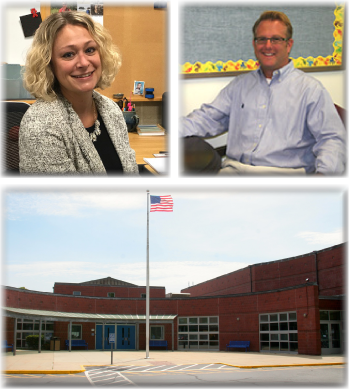 Old Saybrook Middle School’s principal, Dr. Krista Bauchman (photo top left), and associate principal, Matthew Walton (photo top right), will be receiving a framed CAS certificate and three-year positive school climate designation to recognize and honor their achievement. As a service to other schools wishing to improve their positive climate practices, past award winners’ contact information is linked to the CAS website at http://cas.casciac.org and these exemplary schools welcome inquiries and visitors.